One of the nice things about living in Philadelphia is the Greater Philadelphia Philosophy Consortium. The consortium is made up of the philosophy departments of local colleges and universities (including The University of Delaware). The member institutions share information about events of interest to philosophers. Given the number of institutions in the consortium, there’s nearly always something good going on. It’s easy for those of us in the fields of philosophy and theology delude ourselves that we have a monopoly on scholarly work on Kierkegaard. This symposium demonstrated clearly, however, that Kierkegaard is of great interest to people in the field of literary theory. I don’t know to what extent Kierkegaard’s thought figured into the presentations the first day, but references to Kierkegaard were much in evidence on day two. Lisi, whose first book was entitled Marginal Modernity: The The Aesthetics of Dependency from Kierkegaard to Joyce (Fordham, 2012) is hard at work on two new book projects, both of which involve Kierkegaard. There was a stimulating discussion after Moi’s paper. It ranged far and wide, but the part that I thought would be of particular interest to readers of this blog concerned a problem of translation. Danish has two words that can be translated as “silent”: “stille” and “tavs.” The former is used to refer both to nature and to people. That is, one speaks in Danish of a wood (i.e., forest) being “stille,” just as one could in English refer to it as “still.” But “stille” can also be used to describe people. The expression “ti stille” means “be quiet,” or “be still,” as we also often say in English. This is important because during the discussion after Moi’s paper, one of the participants in the seminar pointed out that while Moi had referred repeatedly in her paper to Hedda’s “silences” in Ibsen’s play Hedda Gabler, Hedda is not really silent at all but speaks throughout, and at least occasionally on precisely the topics on which Moi had described her as “silent.” Moi conceded the point but then explained that although Hedda speaks throughout the play, her speech fails to reveal important truths that are relevant to the plot. To my mind, Moi didn’t need to concede anything to her critic. Hedda is “silent” in the sense in which we often use the expression in English. That is, she is not forthcoming with information that is important to the circumstances of the play. The Oxford English Dictionary offers the following as the second definition of “silent”: “Omitting mention of or reference to, passing over or disregarding, something in narration; containing no account or record.” “Unmentioned, unrecorded; marked by the absence of any record” is also given as a definition. So yes, Ibsen wrote in Danish, but that’s basically the same thing as saying he wrote. Even today Danes and Norwegians rarely bother to try to speak one another’s language. Modern Norwegian, though it sounds very different from Danish, is more like a dialect of Danish than a different language. Finally, I may have said this before, but it bears repeating. One of the benefits of learning Danish is that when you get very good at it, you’ll be able to read Norwegian. I keep forgetting that. 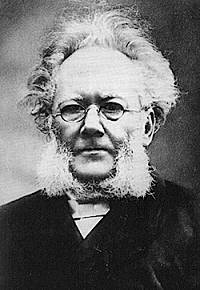 I had such a good time at the symposium, though, that I’ve decided to read some Ibsen! Yes it is a person, who is ‘tavs’ – but in poetry it is often used for the forest too – and I thougth it should be fun to try this on Google ‘den tavse skov’ [the silent forest] and got a lot of interesting results! Thanks for this. It’s very interesting. Perhaps descriptions of forests as being “tavs” involve implicit references to the fact that the animals one presumes are there are silent. I think your point is very well taken though in that language tends to be messy. It is probably always better to say that a word is “rarely” used in a particular way, rather than that it is “never” used in that way. I wouldn’t have said “never” even in this case if Moi hadn’t made that remark about agency. I don’t think you need a password to post a comment. Thanks for that correction. One correction like that is easy to make. I made it already. I’m glad you were pleased about being invited to England. I thought you would be!